Sen. Ted Cruz (R., Texas) said in an interview with the Washington Free Beacon that the "hatred and bigotry" he encountered when he was booed off the stage at a Middle Eastern Christian conference for defending Israel on Wednesday night was like nothing he has previously seen in his political career. "I’ve certainly encountered audiences that disagreed with a particular point of view. 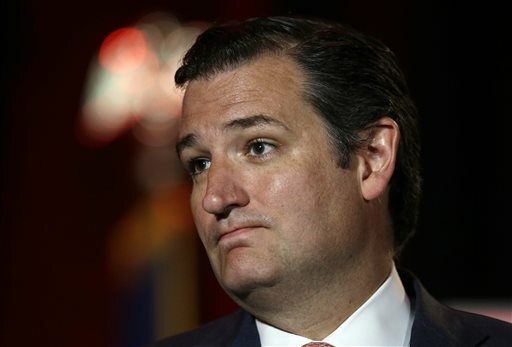 But this virulent display of hatred and bigotry was remarkable, and considerably different from anything I’ve previously encountered," Cruz said, just a few hours after his pro-Israel speech to the In Defense of Christians conference was drowned out by shouts and jeers from the audience. The senator was booed off stage at the conference, which is aimed at raising awareness for the persecution of Middle Eastern Christians, after saying that Christians "have no greater ally than Israel" and calling on the audience to support the Jewish state. "The division and anti-Semitism expressed tonight by some of the crowd is not reflective of the teachings of Christ, and is in fact directly contrary to the tenets of Christianity," Cruz said. In video posted by the Daily Caller, audience members can be heard shouting at Cruz during his keynote address. "I am saddened to see that some here, not everyone, but some here, are so consumed with hate," said Cruz, before he was interrupted with shouts of "all of us!" from the audience. "You speak for yourself!" one participant yelled during the senator’s defense of Israel. "If you will not stand with Israel and the Jews, then I will not stand with you," said Cruz, as audience members drowned him out with boos and cries of "enough!," "no!" and "never!" The Free Beacon reported on Wednesday that several Hezbollah and Syrian regime supporters were scheduled to speak at the conference. Numerous members of Congress were scheduled to attend, including Sen. Debbie Stabenow (D., Mich.), Rep. Darrell Issa (R., Calif.), and Rep. Brad Sherman (D., Calif.). The speakers included Maronite Patriarch Cardinal Bechara Raï, who has defended Hezbollah’s right to attack Israel and has called for a meeting with the Iranian-backed terrorist group’s leader Hassan Nasrallah. Another speaker, Syriac Orthodox Church Patriarch Moran Mor Ignatius Aphrem II, boasted on his official Facebook page last week about his Sept. 5 meeting with a "high level delegation from Hezbollah." The conference also featured Antioch Church patriarch Gregory III Laham, who has blamed terrorist attacks against Iraqi Christians on a "Zionist conspiracy against Islam" aimed at making Muslims look bad. "It is actually a conspiracy planned by Zionism and some Christians with Zionist orientations, and it aims at undermining and giving a bad image of Islam," Laham said in 2010, according to the Daily Star. Despite the controversial speakers, Cruz decided to speak at the conference because he wanted to bring attention to the persecution of Middle Eastern Christians, his office told the Free Beacon on Wednesday afternoon. He said Wednesday night that he was disappointed he was unable to give the speech he had planned. "I’d intended to talk tonight about Pastor Saeed Abedini, wrongfully imprisoned in the nation of Iran for practicing his Christian faith. I’d intended to talk tonight about Mariam Ibrahim, wrongfully imprisoned and sentenced to torture and death for her Christian faith," said Cruz. "I had intended to talk about the three Jewish teenagers who were kidnapped and murdered by Hamas simply because they were Jews." "Radical Islamic terrorists do not distinguish between Christians and Jews," he added. "They hate us both, they murder us both." Funding for the conference was provided by top Clinton donor and Lebanese-Nigerian billionaire Gilbert Chagoury, organizers told the Free Beacon on Tuesday. A spokesperson for the conference did not immediately respond to request for comment. This entry was posted in Issues and tagged Hezbollah, Israel. Bookmark the permalink.